Reactors 1, 2 and 3 were in operation at Tokyo Electric Power Company’s (Tepco’s) east coast Fukushima Daiichi nuclear power plant when the earthquake struck. Three other reactors were already shut for inspection but all three operating units underwent automatic shutdown as expected. Because plant power and grid power were unavailable during the earthquake, diesel generators started automatically to supply power for decay heat removal. UPDATE: One of Japan’s Fukushima nuclear reactor containment buildings suffers a catastrophic explosion, on March 12th at 00:00 midnight P.S.T., as this video shows at 0:45 seconds. Not good at all. Very bad. ‎”FUKUSHIMA, Japan, March 12 (Reuters) – Radiation leaked from an unstable Japanese nuclear reactor north of Tokyo on Saturday, the government said, after an explosion blew the roof off the facility in the wake of a massive earthquake. “An unchecked rise in temperature could cause the core to essentially turn into a molten mass that could burn through the reactor vessel,” risk information service Stratfor said in a report before the explosion. “This may lead to a release of an unchecked amount of radiation into the containment building that surrounds the reactor. The 2011 Sendai earthquake and tsunami (東北地方太平洋沖地震 Tōhoku Chihō Taiheiyō-oki Jishin?, literally “Tōhoku region Pacific Ocean offshore earthquake”) was an 8.9-magnitude megathrust earthquake that created tsunami waves of up to 10 metres (33 ft). It was measured at 7 on the Japan Meteorological Agency seismic intensity scale in the northern Miyagi Prefecture, Japan, with an initially-reported magnitude of 7.9, while the JMA’s tsunami warning listed the magnitude as 8.4, later updated to 8.8. The earthquake focus was reported to be off the Oshika Peninsula, the east coast of Tōhoku on 11 March 2011, at 05:46 UTC (14:46 local time) at a depth of 24.4 kilometres (15.2 mi). News reports by Tokyo Broadcasting System (TBS) indicate that at least 300 people have died and another 530 are missing in six different prefectures, although it is feared the total number of dead could be far higher. To find someone or to report information about someone in the Japanese 2011 Earthquake you can use the Google Person-Finder application to search and post information. 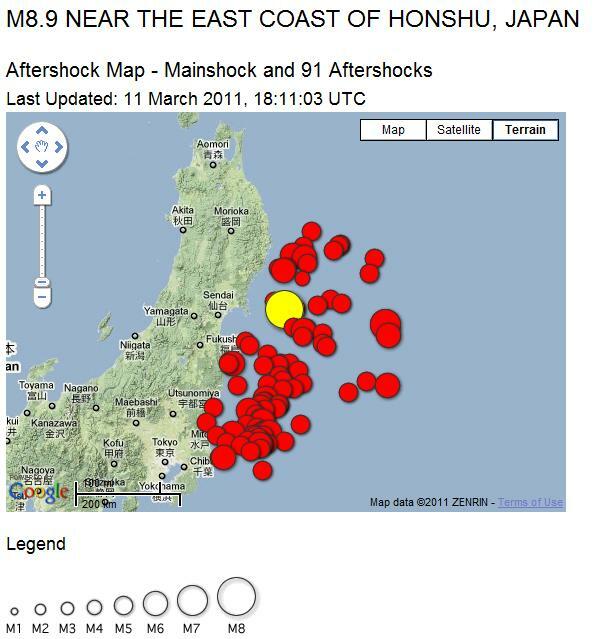 The USGS Earthquake Hazards Program page for the 2011 March 11 05:46:23 UTC Magnitude 8.9 – NEAR THE EAST COAST OF HONSHU, JAPAN. The 8.9-magnitude earthquake that shook Japan early March 11 blew out the cooling systems of two nuclear reactors there. An inability to cool the reactors could cause radiation leaks, and both power plants are “bracing for the worst,” according to government officials. “At present we have no reports of any radioactive materials or otherwise affecting the surrounding areas,” Japanese Prime Minister Naoto Kan told the press. 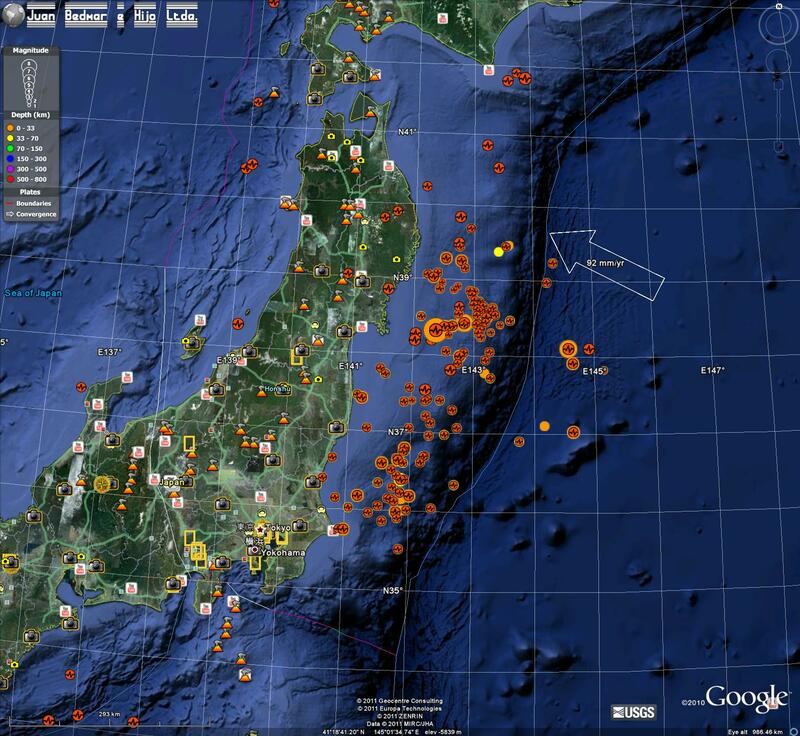 The malfunctions are occuring at the Tokyo Electric Power Co.’s Fukushima Daiichi power plant near Tokyo and the Tohoku Electric Power Co. facility in Onagawa. Chief Cabinet Secretary Yukio Edano said that all the necessary precautions are being taken to prepare for radiation leaks, including evacuating thousands of residents within a 3-mile radius of the Fukushima facility. Eleven reactors nearest the quake’s epicenter automatically shut down upon sensing vibrations in the early hours of March 11. “Reactors shut themselves down automatically when something called ‘ground acceleration’ is registered at a certain point, which is usually quite small. It will instantly drop control rods into the [nuclear] core,” Professor Tim Albram, a nuclear fuel engineer at the University of Manchester in the U.K., explained to the press. A map of the earthquake zone shows how volatile this location is. The March 11, 2011 Earthquake was located at the largest large orange dot in the image above. Image source: Google Earth. 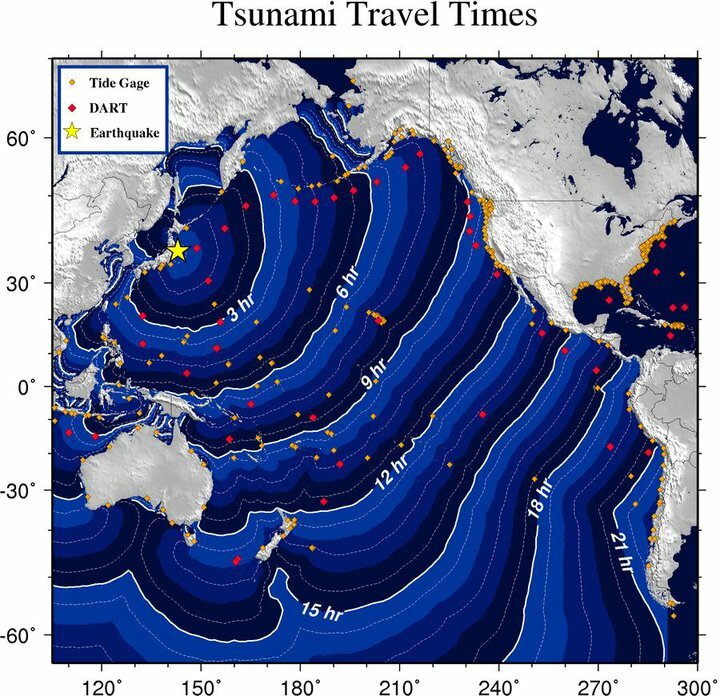 The March 11, 2011 Earthquake projected tsunami shock wave time to impact after quake across the pacific basin. Image source: Wikipedia. 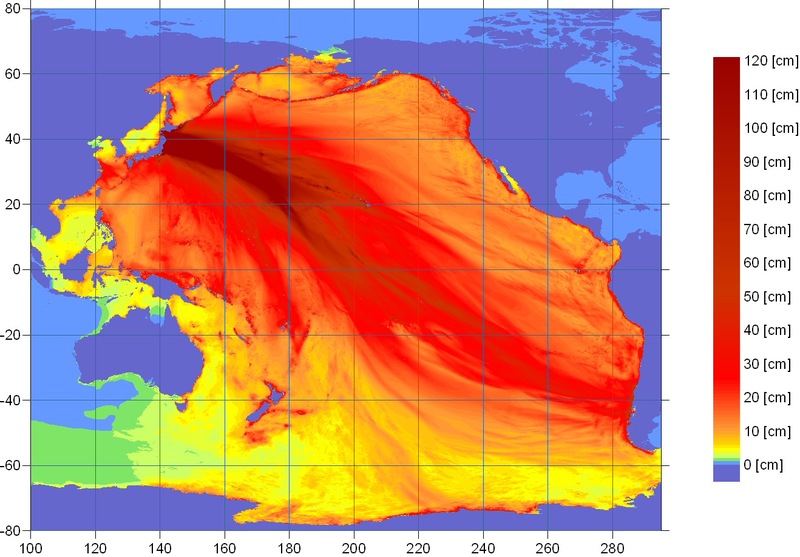 The March 11, 2011 Earthquake projected tsunami shock wave impact energy projections after quake across the pacific basin. Image source: NOAA via Wikipedia. Santa Cruz, CA, USA hit by small tsunami surge wave that caused some damage. “Crescent City, Santa Cruz hit hard by tsunami from Japan quake. Japan may have been moved 8 feet! “(CNN) — The powerful earthquake that unleashed a devastating tsunami Friday appears to have moved the main island of Japan by 8 feet (2.4 meters) and shifted the Earth on its axis. I don’t know what to make of the following except to note it as an interesting anomaly. Correlated times of magneto meter readings with USGS earthquake readings. This entry was posted on March 11, 2011 at 9:44 am	and is filed under Adult Supervision Required, Complex Systems, Disasters, Double Yikes! !, Energy, Humbled by Nature, Reality Based Environmentalism, TerrorForming Earth, Terrorfying, The End is Nigh, The Sky Is Falling, Video, Violent, Yikes!, Yikes! The sky really is falling!. You can follow any responses to this entry through the RSS 2.0 feed. You can leave a response, or trackback from your own site. Heya i am the very first time listed here. I stumbled upon this kind of table we to get This process helpful & the idea taught me to be out there a good deal. I hope to grant something rear as well as assist others just like you made it simpler for me personally.